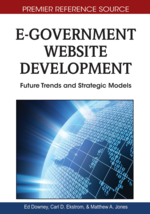 This chapter evaluates the implementation by local government websites of President William Jefferson Clinton’s Executive Order 13166, Improving Access to Services for Persons with Limited English Proficiency (LEP) (Clinton, 2000). The purpose of Executive Order 13166 is to facilitate access to federally funded services. In the U.S., local governments are the most important basic service providers. This assessment is fundamentally important in light of the growing number of non-English speakers who reside in the country. The chapter looks at a diverse set of local governments and focuses on availability of information in Spanish, by far the predominant non-English language, spoken in about 12 percent of households in the U.S. in 2006. Government Web pages are assessed in terms of the degree to which 10 key government service areas are accessible in Spanish. The chapter identifies best practices for governments to make sites accessible to individuals with limited English proficiency. The relationship between language and the roles and rights of the governed is the focus of a relatively limited body of literature. This section briefly reviews the most relevant of this literature with regard to the present study. Brugger (1996) and Arzoz (2007) both credit German jurist Georg Jellinek with a system of categorizing human rights. Brugger, who traces the development of human rights to the American and French revolutions, summarizes three types or categories of rights: status negativus, most simply, liberty; status activus, the right to participate in the democratic process; and status positivus, relating to social and economic freedoms (1996, p. 597).